Hi there! I am very happy and excited to introduce you to some more friends from this beautiful wilderness that surrounds us in InnTheWild, Masinagudi. These animals belong to the category of pack hunters. Tactful, sleek, intelligent and simply supreme hunters in these woods – the Indian Wilddogs a.k.a Dhole. Come visit us at InnTheWild, Masinagudi and experience first hand the balance of nature and the circle of life. On December 14, 2014 our guest Mr. Vamsi Somarouthu and his friend were relaxing in the balcony of tree house. They were enjoying the lake side view when at around 2 o’clock they saw a pack of nine wild dogs emerged from forest and started roaming around the lake. At around 4 o’clock while I was waiting at the reception for our guests to start the nature walk, my undivided attention was towards lake side. I was planning to conduct a nature walk on the same route. I could hear lots of alarm calls coming in and I knew at once that today I would witness something special. Just then, I received a call from Mr. Vamsi who said that he could see wild dogs chasing a sub-adult Sambar deer. The moment I heard his words, I got into action – I grabbed my camera and binoculars and hurried to the spot. On the way I also called Capt. Anil and his wife who were there in Tree top. And with what we saw, we were just stunned. Nine wild dogs on wall of our lake and a Sambar swimming in the muddy waters of the lake! I was so involved in this wild scene so I told guests to climb up the Machaan, while I tried to do my best to capture this. I crawled and sat under the Amla tree on the edge of the waterhole capturing with my lens the suspense of what was unfolding in front of me. Suddenly the deer came out and tried to escape. It went to a short distance, got scared and dived back into its safe haven, the waterhole. All of a sudden one wild dog came towards the edge of the lake and was about to dive. I noticed that left ear of this wild dog was missing. 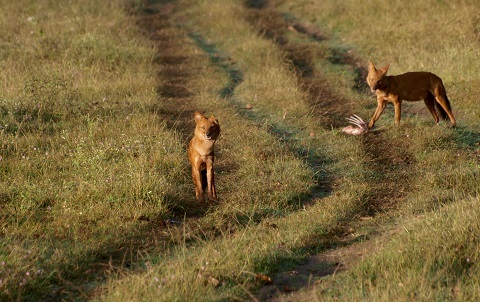 For all this time this particular female wild dog was leading at the front and trying hard for a kill. 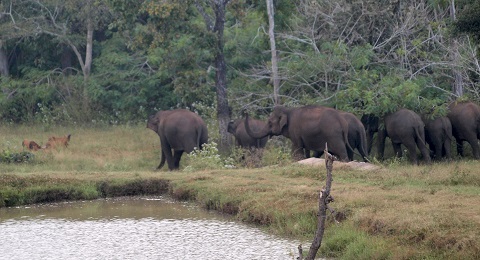 To add more drama to the mix, all of a sudden three big elephants came charging from the bushes and chased wild dog. I was zoomed into my shot and through view finder all of a sudden I could see nothing but giant elephant feet. My heart skipped a beat and I immediately decided to join the others on the Machaan. 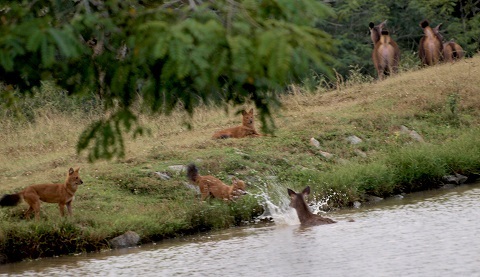 Meanwhile the Sambar deer which was inside tried to take advantage of the situation and came out of the water. Unfortunately when she deer ran towards its freedom, these intelligent, sleek and tactful hunters caught it. Within minutes it was just flesh and bones. After about half an hour only bones were left attached with skin. Next day this same pack of wild dogs came back to the kill site and chewed bones. It sent shivers down my spine. These hunters finished their kill so neatly that there were nothing remained for scavengers! I kept thinking for an appropriate name for these supreme hunters and their leader. Finally I could frame one; LEMA (Left ear missing alpha) is the name of the alpha female of who roams around these thickets with at most supremacy.